Regiment/Catrawd: Royal Welsh Fusiliers and Royal Defence Corps. Military Cemetery/Memorial / Fynwent milwrol: St. Michael's Churchyard, Brynford, Flintshire. Ref No Grave or Memorial / Rhif cyfeirnod bedd: South part of the Cemetery. Died on Sunday 1 December 1918 at The Military Hospital, Oswestry, Shropshire aged 29 years. 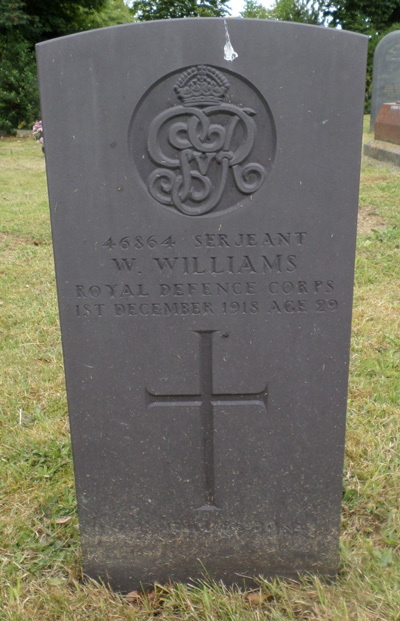 William Williams was born on 3 March 1889 at Brynford, Flintshire. His parents were Robert Williams, born 1859 at Brynford, Flintshire and Hannah Williams (nee Evans) born 1860 at Gronant, Flintshire. The 1901 Census shows that the family lived in Lily Terrace, Brynford, Flintshire. The head of the family was Robert Williams aged 42, who was employed as a Postman in Holywell, Flintshire. His wife Hannah Williams aged 41 and their 6 (six) children – Edwin Williams aged 14, William Williams aged 12, Robert Williams aged 9, Myfanwy Williams aged 7, John Williams aged 4 and Hannah Williams aged 2 years. Nothing is known of his school-days but he did become an Assistant School Master at Bagillt County School, Flintshire. On 20 April 1914 he married Harriet Mabel Taylor, born 7 April 1891 of The Dolphin Inn, Whitford Street, Holywell, Flintshire at Rehobeth Chapel, Whitford Street, Holywell. William enlisted as a soldier with the Royal Welsh Fusiliers and later with the Royal Defence Corps, becoming a Lance Sergeant. At some stage he was admitted to the Military Hospital, Oswestry where he died on 1 December 1918. He was buried on 3 December 1918 at St. Michael’s Churchyard, Brynford, Flintshire. 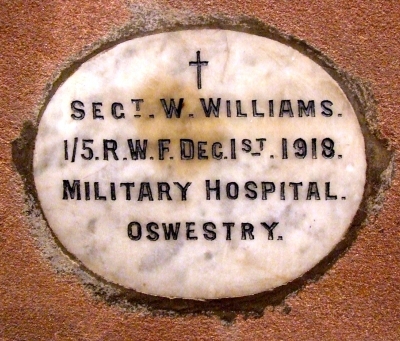 Photograph taken of Sergeant William Williams headstone by Geoffrey Mitchell on Wednesday 19 August 2015. Plaque in St James Church, Holywell.